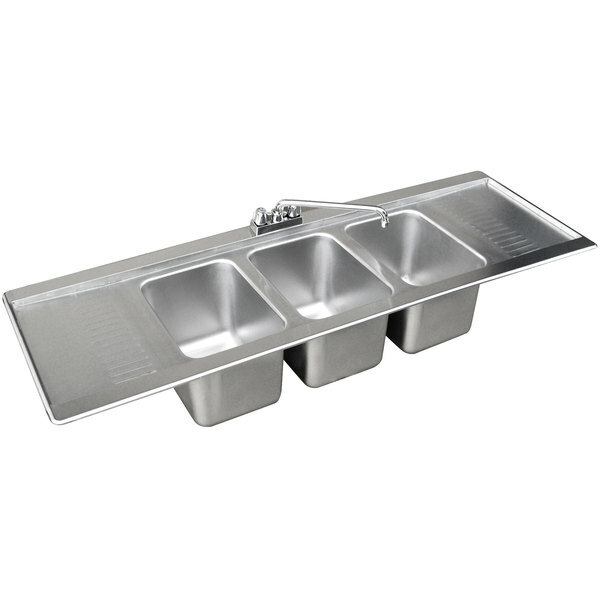 Advance Tabco DBS-53C Three Compartment Stainless Steel Drop-In Bar Sink - 60" x 20"
Three compartments measure 10" x 14" x 10"
Wash, rinse, and sanitize, with this versatile Advance Tabco DBS-53C three compartment stainless steel drop-in bar sink. Each one-piece deep drawn bowl measures 10" x 14" x 10", while the 12" deck mounted swing spout faucet can be moved from left to right above the sink. A pair of 12" embossed and seamless drainboards can be used to let dishes dry or prevent water from spilling out of the sink, which reduces the potential for wet, slippery floors in the immediate area. The advantage of a drop-in sink design is that it allows for a quick and easy installation. Once an appropriately sized cut-out is made in your countertop surface, the sink is simply inserted into the opening. Anchors or metal clips (sold separately) secure the sink to the counter, and silicone or caulk should be applied around the lip of the sink. With your drain in place and water pipe connected, your sink will be ready for operation! This sink is designed for exceptional durability and years of high volume use thanks to sturdy 20 gauge, 300 series stainless steel construction. The sink bowl includes a 9" high overflow pipe with 1 1/2" IPS drain. The unit's faucet meets federal lead free standards, making this Advance Tabco DBS-53C drop-in bar sink the perfect addition to any commercial foodservice operation.